This is a follow-up to the statement we issued on July 18 about our decision to place BT3-032 Son Goku/Heightened Evolution Super Saiyan 3 Son Goku on the watch list. Since that time, Colossal Warfare was released, and regional tournaments have been held in some countries around the world. We’ve received decklists from top-ranking players, and observed several high profile tournament matches in person. 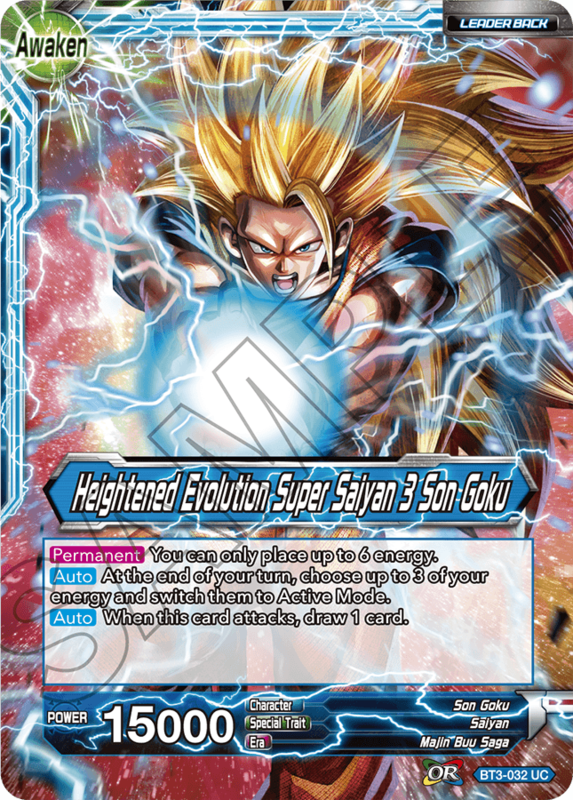 Heightened Evolution SS3 Son Goku has been included in around 50% of decks, including the dominant Tier 1 decks. However, not all of the tournament winning decks included the card in question. As a result, we’ve decided not to ban or restrict BT3-032 Son Goku/Heightened Evolution Super Saiyan 3 Son Goku, or issue any errata to the card. We’re also removing it from the watch list. ・Though the card is extremely powerful and used in many decks, the card itself is not powerful on its own, and merely falls into the same category as other easy-to-use, useful cards. ・Meta cards like EX03-27 Forced Ejection Masked Saiyan from the Ultimate Box will only become more plentiful going forward, resulting in an environment where the card is easier to counter. ・Issuing errata or restricting/banning Heightened Evolution SS3 Son Goku will cause Tier 2 decks with BT4-024 Hirudegarn/Awakened Perfection Hirudegarn to take its place. The fundamental issue will remain. However, there are clearly a few deck types more capable of winning than others in the current environment. We feel it necessary to promote the number of deck types capable of performing at a tournament level. We’ve concluded that the backbone of these more powerful decks is BT4-045 The Legendary Flute. 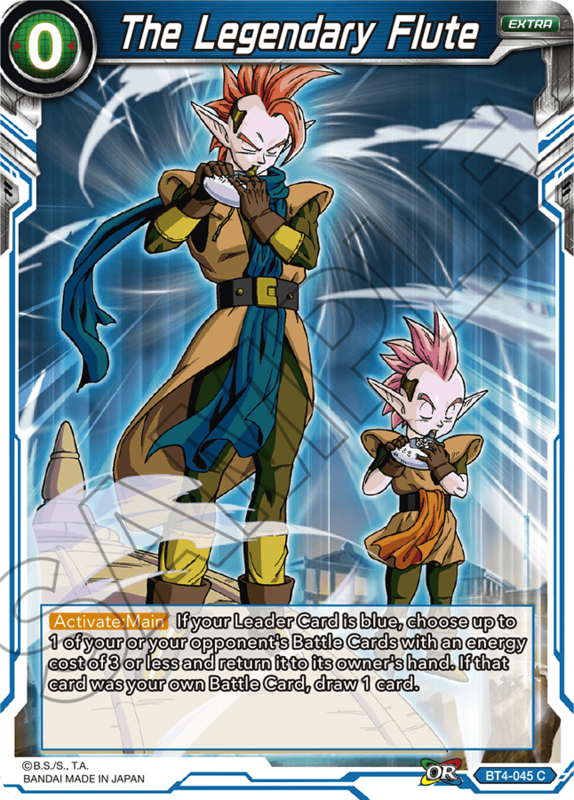 Almost 100% of decks running blue Leaders also play Flute, usually in the early game with cards that control life totals, allowing players to fill their hand with cards and awaken quickly. We believe this card is responsible for speeding up the game and making blue Leader Cards dominant compared other colors. As such, we have made the decision to restrict the number of copies of BT4-045 The Legendary Flute players can include to 1 per deck starting on September 21. *This includes your side deck. A total of 1 copy of the card can be included between your deck and side deck. We don’t believe the card’s effect itself is dangerous enough to warrant issuing errata or banning the card. The issue, as we see it, is the number of copies players can include in decks. By changing the number of times players can use the card, and at what time, we think the card will arrive at the power level we originally anticipated. Our hope is that limiting the card to 1 copy per deck will also result in more decks using non-blue Leader Cards. Additionally, by weakening the aggro decks currently dominating the environment and allowing room for more midrange decks, we expect games to last longer, leading to more decks capable of competing at a tournament level. We know many of you have enjoyed using the card, and we want to apologize. This decision is intended purely to create a better overall game environment, and we ask for your understanding at this time. We’re doing everything we can to develop and support a game that will bring countless hours of enjoyment to both Dragon Ball fans and card game fans alike. Thank you for your support; we’re looking forward to seeing all the exciting new decks you create!